Many cities now recognise the benefits of urban transit. Alongside London, Birmingham, Wolverhampton, Sheffield and Nottingham have all reintroduced tramway systems to meet customer demand for convenient and fast movement in to city centres. 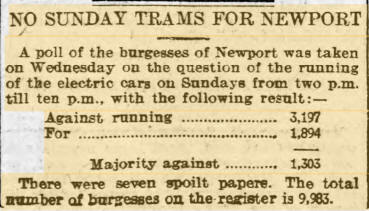 Sadly Newport lost her tram system just prior to the war along with most British towns and cities. 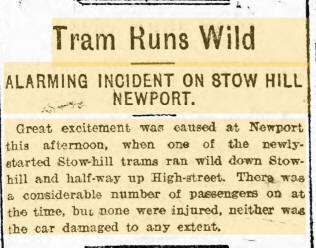 In 1891 the Newport Corporation ordered the building of a tramway system as part of ambitious plans for the system. The tramway envisaged eight routes or links. The plan was published in the London Gazette, follow this link. Newport Corporation Tramways operated the tramway service in Newport between 1894 and 1937. Newport Corporation took over the Newport Tramways Company on 30 July 1894. The company was then leased back to a Cardiff businessman Solomon Andrews to continue the service. Solomon Andrews (5 April 1835 – 9 November 1908) was an entrepreneur who was head of the Solomon Andrews and Son company which was based in Cardiff. On 17 December 1863 he obtained a licence to operate a horse drawn cab from the new residential districts of Canton and Roath to Cardiff Docks. By 1865, he had eight and is thought to have been an omnibus proprietor by December 1866. His business interests grew rapidly to include tramways, buses, draperies and collieries. His son Francis Emile (1858–1943) joined the company and eventually became a partner. The business became known as Solomon Andrews and Son. The current company (Newport Transport) came into existence on the 30th July 1901 when Newport Corporation took over the running of the horse tramways within the town . The horse tramways were soon replaced in the spring of 1903 by the first electric tramcars. The first electric services started on 9 April 1903. The trams sported a livery of Maroon and Cream. 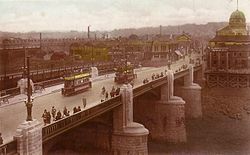 In 1904 the first tram crossed Newport Bridge in to Maindee. Trams to Maindee initially terminated near Kensington Place but were further extended along Chepstow Road to Royal Oak. Between 1903 and 1937 a total of 58 tramcars were purchased and operated. The network covered over 8.55 miles in the town. 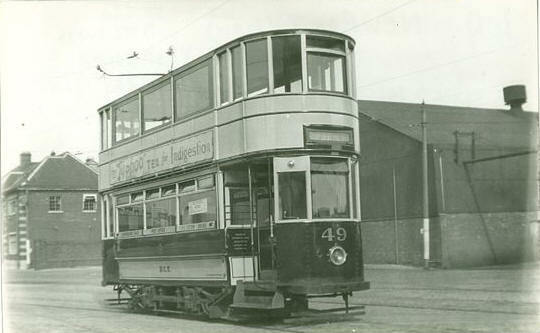 The operation of trams ceased on the 5th September 1937 when the last tram departed for the Corporation Road depot. In common with the vast majority of UK tramway operators, Newport employed the services of female staff to replace male servants lost to the armed services. The first ladies were appointed in July 1916 as conductresses - apparently always referred to as 'Women Conductors' in Newport - and from 1917, a small number of motorwomen too. Unlike most operators however, Newport continued to employ women tramcar staff well after the war had finished, only releasing the last of them in August 1921. Newport Transport operations (now bus, formerly trams) are based at their depot at 160 Corporation Road, Newport. The first motor buses were purchased in 1924 and the first service was operated between Rodney Road and Gibbs Road. Over the years Newport Transport and its predecessors have operated over 500 buses. To day the operational fleet stands at 82 and is made up of mixture of Minibuses, Single Deckers and Double Deckers. The colour scheme of the vehicles has change over the years, the first tramcars wore a cherry and cream livery, which was later changed to maroon and cream. The motor buses were originally painted in a chocholate and cream livery, this was replaced in 1937 with a predominant green colour with a cream band. In 1964 the double deck livery was changed to the green bottom half/ cream top that is still the basis for the livery used today. The only difference is that the green has become darker since 1999.